For fifty-seven years he was by turns Baxter Brothers' mill manager, engineer, partner and finally senior partner. An inventor and improver of machinery and processes he helped to make the firm world leaders in flax spinning and linen manufacture. 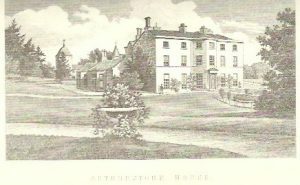 Arthurstone House, Nr Meigle, Perthshire, c.1869-1891. Congregationalist (attended Ward Chapel, Dundee, c.1843-1864), but attended the Church of Scotland for greater part of his life. Supported Liberal Party, but in later life tended towards Conservatism. Director, Watt Institution, Dundee, 1840-1844 and 1853-1854. Subscriber to Dundee Infirmary and the industrial schools. Mars Training Ship (one of the original organisers). Dundee Sailors' Home (one of the founders). Director, Dundee & Newtyle Railway. Restoration of Wishart Arch, Dundee, 1877. Funded Ardler quoad sacra parish church and manse construction and endowment of minister, c.1883-1885. Associate member of Dundee Naturalists' Society, c.1881. Vice-president, YMCA, Dundee. Justice of the Peace associated with the Dundee district, c.1871-1891. Elected member, Kettins School Board, 1873-1891. Subscriber no.29 – Sir David Baxter of Kilmaron – partner in Baxter Brothers & Co. Subscriber no.68 – W.O. Dalgleish – partner in Baxter Brothers & Co.
Baxter Bothers & Co., Dundee. Peter Carmichael was the son of James Carmichael and Rachel Drummond. He was born at Kirkland, Fife where his father managed a mill on the River Leven. 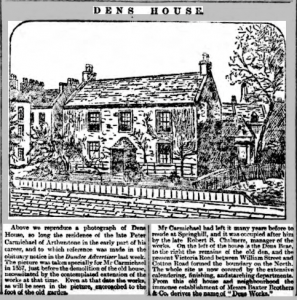 His family moved to Limehouse near London in 1812 where his father managed a spinning mill before returning to Scotland in 1816 and taking up the tenancy of a small mill at Dens in Dundee. Peter Carmichael's father was " a practical mechanic as well as an experienced spinner" and "began by renovating and improving the machinery, so that when the mill was started again he was able to produce yarns both in flax and tow that gave entire satisfaction to the manufacturers." The house the family occupied at Dens Brae Carmichael later recalled as being on the side of a romantic wooded den and at this time was on the very edge of the town. Peter completed his schooling in Dundee at the Grammar School and the Academy and recalled later that "while still at school I had begun to work. I used to keep my father's books in the evenings and by going about the mill had learned in a general way the various operations of hackling, carding and spinning. It seemed natural that I should follow my father's occupation of mill spinner of flax and tow and it was therefore decided that I should begin by serving my apprenticeship as a mechanic." He was sent to Low's foundry in Monifieth in 1825 where William Low was his "prentice master" and "afterwards became a valued friend." This firm was experienced in making spinning machinery. 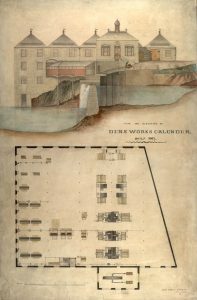 After serving his time at Low's Foundry, Carmichael worked for a few months at the Dundee Foundry, but through his father's old contacts went to a position at Seaward's Canal Iron Works, Limehouse in 1830. At this place he came into contact with the famous sailor, Lord Cochrane, and worked on some of his designs. While he was in London his mother died. He decided to move to William Fairbairn's in Manchester, but on the advice of James Carmichael, the Dundee engineer (his future father-in-law), he moved to work with William's brother, Peter Fairbairn, in Leeds. During his time there he was visited by William Baxter, father of John and William of Baxter Brothers & Co., who was minded to offer him a manager's post. He was impressed with Peter's knowledge, but decided he was too young. 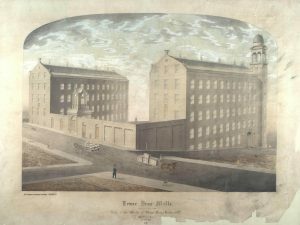 Peter's father asked him to return home and he briefly took up a position with Thoms Brothers & Co. at their new mill in Barrack Street, Dundee, but William Baxter came calling again and offered him the position of manager of the mill being built at Upper Dens. He commenced work on 6 December 1833. 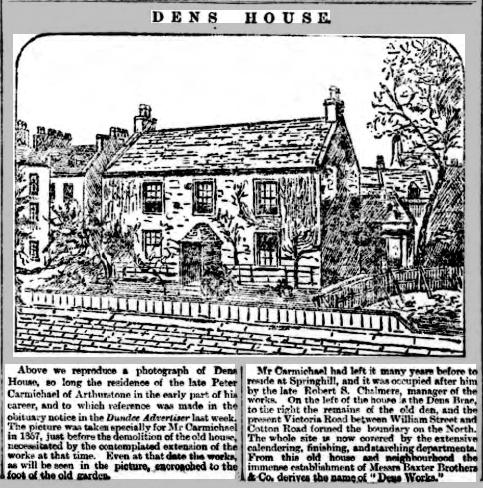 The manager of the Lower Dens mill died of typhus soon after this and Peter assumed the general management of the works. "As manager to Baxter Brothers & Co. he was the right man in the right place. It was the ambition of Mr Baxter and his two sons, John and William, who then formed the firm, to hold the foremost place in the trade, and Mr Carmichael, by his mechanical genius and knowledge of what was being done in other towns, by his firm yet suave management of the workers, by his intuitive perception of what a man or machine could be got to do, and by his careful calculation of costs and his painstaking experiments, was the very man to secure that place for them." In 1836 Baxter Brothers built a power-loom factory with the lead being taken by David Baxter, who had recently joined the firm. The construction of the factory entailed the removal of James Carmichael's spinning mill. Most of the family removed with their father to the bleachfield at Harestane, but Peter's sister, Euphemia, remained with him at Dens Brae. They attended the Ward Chapel together. Peter married Margaret, the daughter of James Carmichael, engineer, in 1842 (they were unrelated) and the couple made their home at Dens Brae and also attended the Ward Chapel together. By 1846 Carmichael had patented three inventions: a hackling machine, a rubbing machine and, with Peter Fairbairn, a rotary gill. In 1853 he produced a weft-winding machine. He also carried out experiments to modify William Nairn's reeling machine and improved the finishing process by using hydraulic pressure in calendaring. It was his habit to make "an annual excursion in the quest of mechanical improvements." 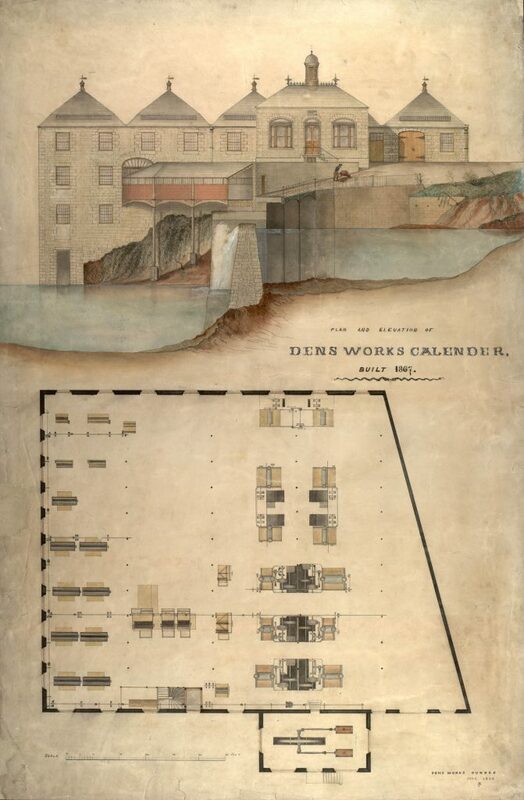 In addition Carmichael, along with Glasgow engineer, Randolph Elliot, designed the Lower Dens Works in 1850. Baxter Brothers & Co continued to specialise in linen and for some years they had supplied cloth to Haywards of Crewkerne, who made them into sails for the navy. In 1855, by painstaking attention to quality, Baxter Brothers & Co were able to overcome the Admiralty's prejudice against power-loom cloth and secured a direct order. These and other government contracts helped secure the financial position of the firm, thereby contributing greatly to the prosperity of Dundee. The mechanical skill of Peter Carmichael greatly facilitated the growth of the company and allied to the business capacity of David the firm became one of the largest manufacturing houses in the world. For the sake of his wife's health he had taken a cottage at Seafield, Broughty Ferry for a year or two - " a lodge in the midst of roses"- and their eldest son, James Drummond was born there in 1849. The rest of the children were born in Dundee. Charles in 1850, but died in infancy. 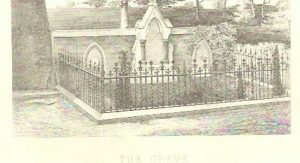 Grace Margaret in 1851 and their last son in 1853, was named William Baxter after the recently deceased William Gorrell Baxter of Baxter Brothers. Having lost his two brothers, William and John, in a short space of time, David Baxter turned to Carmichael to become a partner. After some persuasion he yielded "to the urgent request of the remaining brother" and became a partner on 1 June 1853. At this time there were about 2,500 workers, including 200 mechanics for making and repairing machinery. 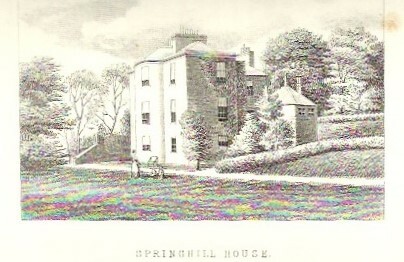 About the same time that he became a partner, Peter and his family left Dens Brae, or 111 Bucklemaker Wynd as it appears in the 1851 census, and moved to Springhill House, Ferry Road, Dundee. His sister, Euphemia, was also part of the household and appears in directories as a committee member of the Dundee Ladies Anti-Slavery Association. Springhill was an early 19th century house situated on a wooded hill overlooking the river "once a celebrated villa location." Peter continued to experiment and gave his attention to the causes and prevention of fires in mills, particularly in their chimneys. He also continued to improve the design of mill machinery and believed that all good inventions evolved out of the need for them in the ordinary course of work. He was also heavily involved in the design of extensions to the works and the "three tall chimneys of this great industrial complex were designed like hollow Egyptian obelisks, reflecting the taste of their celebrated chief engineer, Peter Carmichael." At the time of the subscription to the Albert Institute Peter Carmichael was already a man of considerable standing. His description in the local directories chart his rise from mill manager to engineer to manufacturer and flaxspinner and the 1861 census proclaims him as "flaxspinner and linen manufacturer, employing about 3500 persons." His subscription to the Albert Institute was very generous. The proceeds of his partnership in Baxter Brothers and the returns from his patents must have left him comfortably situated and like many of his contemporaries among the merchants and manufacturers of Dundee his thoughts turned to obtaining a country retreat. In about 1864 Peter Carmichael took a lease of Bonhard House and shootings, Scone, Perthshire from Alexander McDuff of Bonhard. The lease being up on Bonhard he then purchased Arthurstone House, Coupar Angus, Perthshire and also bought some adjoining farms from the Wharncliffe Estate. His son, James Drummond (known to the family as Drummond) had joined Baxter Brothers as a clerk in 1867, but as his health was not robust and his hearing increasingly poor he left the firm and took up the running of Mill of Camno Farm on his father’s estate. In 1871, Peter’s wife died aged 52 and the following year he lost his long-time business partner, Sir David Baxter. This death left Carmichael as the senior partner of the firm, along with William Ogilvy Dalgleish, who had been a partner for twenty years. By this time the firm had grown to employ about 4,500 hands and Peter brought his nephew, James Carmichael, into the firm. In 1873, his daughter, Grace Margaret, died aged 21 and his last remaining child, Drummond, died in 1881, aged 32. In fulfilment of his son’s wishes, Peter acquired a site and built a church and manse for the village of Ardler, endowed a clergyman and helped achieve the creation of Ardler as a quoad sacra parish of the Church of Scotland. In a sermon after Peter’s death, the minister in question, the Rev. Dr. Milne, stated that “I know of no instance in the history of the Church in which the whole equipment of a church and parish has been provided by one man in his lifetime without a penny of expense to the receivers.” The bell provided was named Grace Margaret in memory of his daughter. Peter continued to act as the local laird, attending meetings of the heritors and serving for many years on Kettins School Board. He took a particular interest in Ardler School, giving “handsome entertainments” to the parents and children and supplying books for the juvenile library. In 1885 the workers at Baxter Brothers subscribed for a portrait of Carmichael by Robert Herdman and it was presented to him with great ceremony. This may be the same portrait that hung in the porch of Ardler Church. Carmichael also presented a stone font. Carmichael died in 1891. His funeral cortege passed through the village of Ardler on its way to Kettins Churchyard, with the school pupils and residents lining the street as a mark of respect for their benefactor. In Dundee, the Wallacetown Parish Church bells were tolled, Baxter Brothers’ works closed at 2.00pm with full pay to the workers and many of the vessels in the harbour lowered their flags to half-mast. He left the sum of £516,000 at his death. The meeting of the Church of Scotland’s Dundee Presbytery the following month reported that he had left money to Wallacetown Parish Church, St. Andrew’s Parish Church and the Princes Street Congregational Chapel, observing with approval that these were the churches most used by Baxters’ workers. Peter Carmichael joined Baxter Bros at the time when Dundee became the biggest linen manufacturing town in Britain. His engineering and inventive skills enabled the power-loom to be utilised in linen manufacture and by 1867 Baxters had more power-looms than any other textile manufacturer. Carmichael actively promoted the bid to bring the British Association for the Advancement of Science to Dundee in 1867 and sat on committees during the event. A popular man with active interests in church and art, and a lover of nature, he was also a noted philanthropist supporting the Dundee Royal Infirmary and the Mars Training Ship amongst many others. Old Parish Records. Wemyss, Fife. Birth/baptism. 2 March 1809. 459/40 317. ScotlandsPeople website and Leng, John, & Co. (1892) Dundee Year Book, 1891. Dundee: John Leng & Co. pp.79-87. Old Parish Records. Dundee. Marriage. 2 May 1842. 282/230 53. ScotlandsPeople website and Gauldie, Enid, ed. by (1969) The Dundee Textile Industry 1790-1885 - from the Papers of Peter Carmichael of Arthurstone. Scottish History Society Series 4 Volume 6. Edinburgh: T. & A. Constable. National Library of Scotland website. Old Parish Record. Dundee. Birth/Baptism. 13 July 1849. 282/190 375. ScotlandsPeople website. Old Parish Record. Dundee. Birth/Baptism. 6 November 1850. 282/200 34. ScotlandsPeople website. Old Parish Record. Dundee. Birth/Baptism. S29 December 1851. 282/200 71. ScotlandsPeople website. Old Parish Record. Dundee. Birth/Baptism. 27 January 1853. 282/200 105. ScotlandsPeople website. Gauldie, Enid, ed. by (1969) The Dundee Textile Industry 1790-1885 - from the Papers of Peter Carmichael of Arthurstone. Scottish History Society Series 4 Volume 6. Edinburgh: T. & A. Constable. National Library of Scotland website. Gauldie, Enid, ed. by (1969) The Dundee Textile Industry 1790-1885 - from the Papers of Peter Carmichael of Arthurstone. Scottish History Society Series 4 Volume 6. Edinburgh: T. & A. Constable. 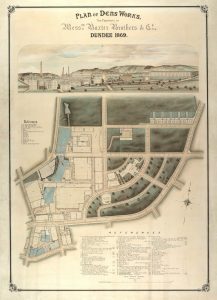 National Library of Scotland website and Dundee Directories, 1837-1850. Local Studies, Central Library, Dundee. 1851 Census Scotland. Dundee. 282 ED63 p.9. Ancestry website and Dundee Directory, 1861-62. Local Studies, Central Library, Dundee. Gauldie, Enid, ed. by (1969) The Dundee Textile Industry 1790-1885 - from the Papers of Peter Carmichael of Arthurstone. Scottish History Society Series 4 Volume 6. Edinburgh: T. & A. Constable. 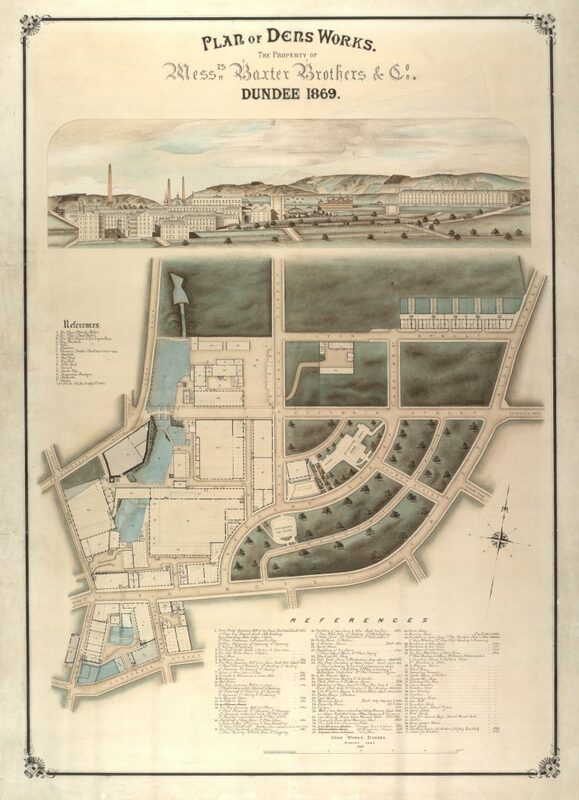 National Library of Scotland website and Dundee Directories, 1853-1875. Local Studies, Central Library, Dundee. Gauldie, Enid, ed. by (1969) The Dundee Textile Industry 1790-1885 - from the Papers of Peter Carmichael of Arthurstone. Scottish History Society Series 4 Volume 6. Edinburgh: T. & A. Constable. National Library of Scotland website and Dundee Directories, 1871-1891. Local Studies, Central Library, Dundee. Statutory Register. Coupar Angus, Perthshire. Death. 6 May 1891. 279/31. ScotlandsPeople website. Dundee Courier, 14 May 1891. British Newspaper Archive. Gauldie, Enid, ed. by (1969) The Dundee Textile Industry 1790-1885 - from the Papers of Peter Carmichael of Arthurstone. Scottish History Society Series 4 Volume 6. Edinburgh: T. & A. Constable. National Library of Scotland website and Dundee Courier, 8 May 1891. British Newspaper Archive. Dundee Courier, 8 May 1891. British Newspaper Archive. Smith, James V. (1977) The Watt Institution Dundee 1824-49. Dundee: Abertay Historical Society. University of Dundee Archive Services and Dundee Directory, 1853-54. Local Studies, Central Library, Dundee. Dundee Advertiser, 12 May 1891. British Newspaper Archive. Miskell, Louise and Whatley, Christopher A. and Harris, Bob, ed. by. (2000) Victorian Dundee - Image and Realities. East Linton: Tuckwell Press. Chapter 8. University of Dundee Archive Services. Dundee Directories, 1888-1891. Local Studies, Central Library, Dundee. Dundee Directories, 1871-1891. Local Studies, Central Library, Dundee. Minute Book, Kettins School Board, 1873-1891. CC1/5/123/1. Perth & Kinross Archives. Leng, John, & Co. (1892) Dundee Year Book, 1891. Dundee: John Leng & Co. pp.79-87 and Gauldie, Enid, ed. by (1969) The Dundee Textile Industry 1790-1885 - from the Papers of Peter Carmichael of Arthurstone. Scottish History Society Series 4 Volume 6. Edinburgh: T. & A. Constable. National Library of Scotland website. Old Parish Records. Wemyss, Fife. Birth/baptism. 2 March 1809. 459/40 317. ScotlandsPeople website. Leng, John, & Co. (1892) Dundee Year Book, 1891. Dundee: John Leng & Co. pp.79-87. Local Studies, Central Library, Dundee. Lythe, S.G.E and Ward, J.T. and Southgate, D.G. (1968) Three Dundonians. Dundee: Abertay Historical Society. University of Dundee Archive Services. Gauldie, Enid, ed. by (1969) The Dundee Textile Industry 1790-1885 - from the Papers of Peter Carmichael of Arthurstone. Scottish History Society Series 4 Volume 6. Edinburgh: T. & A. Constable. National Library of Scotland website and Membership Roll and Admission Register. Ward Chapel Congregational Church. Dundee City Archives. Lenman, Bruce and Lythe, Charlotte and Gauldie, Enid. (1969) Dundee and its Textile Industry 1850-1914. Dundee: Abertay Historical Society. University of Dundee Archive Services. McKean, Charles and Walker, David. (1984) Dundee - an illustrated introduction. Edinburgh: Royal Incorporation of Architects in Scotland and Scottish Academic Press. Local Studies, Central Library, Dundee. Lenman, Bruce and Lythe, Charlotte and Gauldie, Enid. (1969) Dundee and its Textile Industry 1850-1914. Dundee: Abertay Historical Society. University of Dundee Archive Services and McKean, Charles and Walker, David. (1984) Dundee - an illustrated introduction. Edinburgh: Royal Incorporation of Architects in Scotland and Scottish Academic Press. Local Studies, Central Library, Dundee. Henderson, T.F., revised by McConnell, Anita. (2004) Baxter, Sir David, baronet (bap. 1793, d. 1872). Oxford Dictionary of National Biography website. 1851 Census Scotland. Dundee. 282 ED63 p.9 and 1861 Census Scotland. Dundee First District. 282/1 ED32 p.30. Ancestry website. McKean, Charles and Whatley, Patricia with Baxter, Kenneth. (2008) Lost Dundee - Dundee's Lost Architectural Heritage. Edinburgh: Birlinn Ltd. University of Dundee Archive Services. Dundee Directories, 1837-1864. Local Studies, Central Library, Dundee. 1861 Census Scotland. Dundee First District. 282/1 ED32 p.30. Ancestry website. Valuation Rolls, County of Perth, 1865-1869. CC1/8/1/9-13. Perth & Kinross Archives. Valuation Rolls, County of Perth, 1870-1891. CC1/8/1/14-35. Perth & Kinross Archives. Gauldie, Enid, ed. by (1969) The Dundee Textile Industry 1790-1885 - from the Papers of Peter Carmichael of Arthurstone. Scottish History Society Series 4 Volume 6. Edinburgh: T. & A. Constable. National Library of Scotland website and Reid, Mary. (2007) Ardler, Kettins and Meigle - The Story of our Parish. Ardler: Ardler, Kettins and Meigle Parish Church. Local & Family History, A.K. Bell Library, Perth. Statutory Registers. Coupar Angus. Death. 4 May 1871. 279/19. ScotlandsPeople website. Statutory Registers. Coupar Angus. Death. 1873. 279/27. ScotlandsPeople website. Statutory Registers. Coupar Angus. Death. 1881. 279/30. ScotlandsPeople website. Dundee Advertiser, 12 May 1891. British Newspaper Archive website. Reid, Mary. (2007) Ardler, Kettins and Meigle - The Story of our Parish. Ardler: Ardler, Kettins and Meigle Parish Church and Dingwall, Christopher. (1985) Ardler - a village history - the planned railway village of Washington. Dundee: Abertay Historical Society. Local & Family History, A.K. Bell Library, Perth. Leng, John, & Co. (1892) Dundee Year Book, 1891. Dundee: John Leng & Co. pp.79-87. Local Studies, Central Library, Dundee and Minute Book, Kettins School Board, 1873-1891. CC1/5/123/1. Perth & Kinross Archives. Dingwall, Christopher. (1985) Ardler - a village history - the planned railway village of Washington. Dundee: Abertay Historical Society. Local & Family History, A.K. Bell Library, Perth. Dundee Courier, 14 May 1891. British Newspaper Archive website. Dundee Courier, 11 June 1891. British Newspaper Archive website. The information above about Peter Carmichael has been collated from a range of digital and hard copy sources. To the best of our knowledge it is correct but if you are relying on any information from our website for the purpose of your own research we would advise you to follow up the sources to your own satisfaction. If you are aware of an inaccuracy in our text please do not hesitate to notify us through our Contact page.